Would you like to be a special friend to one of our horses? A recurring monthly donation means security for an unwanted horse because we know that we will have a regular source of funding for that horse’s feed, medicine, health care. Every sponsor of $25/month or more will receive a welcome gift of a beautifully hand-sculpted horse made by Elvenspun, and a copy of our yearly calendar. Our Permanent residents are all either living at AGES permanently, or require extensive, long-term rehab to get them ready to be adopted. Scroll down for more information on each horse, or click on a name to get a detailed biography. After you’ve made your choice, please note the name of the horse you would like to sponsor in the donation form. If you want your recurring monthly donation to benefit all of our horses, you still will receive a model of a horse and the other benefits. Join our list of valued sponsors. A recurring monthly donation means security for an unwanted horse because we know that we will have a regular source of funding for that horse’s feed, medicine, health care. Or, you can make a monthly donation for care of all the AGES horses. Maggie is our most recent addition. She was pulled from a kill-pen when AGES discovered she was blind and suffering from a large cut on her forehead. She has settled in well here and has one of the sweetest personalities you could hope for. Your sponsorship of Maggie will ensure we can continue her excellent care until her forever person finds her! Frosty, a beautiful blind mustang, has arrived . . . He is getting acclimated to his new surroundings, and he has quickly bonded to his pasturmates! We'd like to thank the folks at Chilly Pepper Miracle Mustang, located in Nevada, for their tireless efforts and for working with us to get Frosty here. Please check out their website and read about what they do! www.chillypepper.org. Johnnie was purchased from a feedlot in Pennsylvania, saving him from his likely fate at a slaughterhouse. He is sweet and gentle and loves attention. Sadly, he was likely used as a roping dummy so he arrived at AGES with neck and throat problems, infested with lice, limited vision and probably a rear hind stifle injury. But he’s sweet and patient and we want to give him the best life he can have as a permanent resident of AGES. We could really use help with his ongoing vet and medicine expenses. Please consider being a sponsor for Johnnie. RICK is a bay Standardbred gelding, 16 years-old, standing approximately 15.2HH. Rick has scars from pin-firing in his front left leg, as well as severe ring-bone (arthritis) in his pastern joint. He is also unable to vocalize due to a “tie-back” procedure performed on his airway. Amazing Grace Equine Sanctuary pulled Rick from a kill-pen in Pennsylvania, along with Terry and Troy, in March of 2018! Rick is on supplements and pain relievers to ensure he stays comfortable and maintains his current quality of life. He will always have a home at AGES for as long as we believe he is happy and his pain is well managed. Click below to become a part of Rick’s wellness plan. TROY, registered name "Briefs Boy," is a bay, 9 year-old, Standardbred gelding, standing about 15.1HH. We pulled Troy from a kill-pen in March 2018, along with Rick and Terry. Troy arrived to quarantine with obvious previous neglect; riddled with lice and parasites, a wiry coat, and very emaciated. He also has a turned-in foot, due to an untreated break that did not heal properly. Troy eventually came to realize he was being cared for and loved, and he welcomed this contradiction to his previous life. Lice and parasites now gone, his bony body has begun to fill in, and his unhealthy old coat has shed out with regular grooming. Troy now has light in his eyes, and we look forward to seeing what the future holds for this incredibly sweet, gracious, and well-mannered boy! Troy is adoptable, however, he is not sound for riding at this time. Become Troy’s sponsor to help us cover his expenses for as long as it takes to find his forever home. TRIGGER is a 32 year-old Shetland Pony. Surrendered to Amazing Grace Equine Sanctuary after his previous owners became unable or unwilling to care for him and the other two mini horses in their possession. Trigger, previously used for breeding, is now the “seeing” protector and guide for the blind and/or elderly horses at AGES. As the patriarch of our herd and the guardian angel of our blind horses, Trigger is a permanent resident here at Amazing Grace Equine Sanctuary. Your monthly gift as a sponsor to Trigger will not only help provide his regular needs including feed, supplements, hay, farrier, and veterinary care but also with any special care that he requires as the oldest member of the sanctuary! 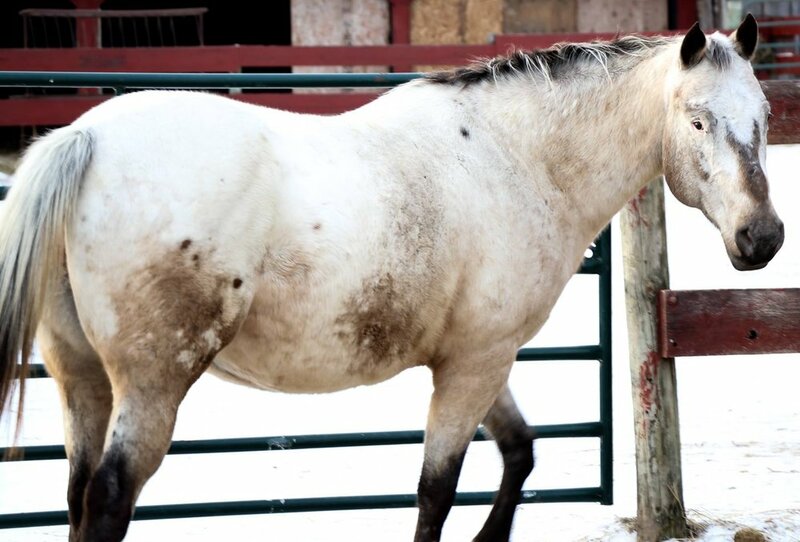 GYPSY is a 13 year-old, 15HH, Paint mare. For many years the family that owned Gypsy used her for trail riding. When she began to develop eye infections her owners, for whatever reason, chose not to have her properly treated by a veterinarian. An infection in one of her eyes, after going untreated for too long, spread to her other eye, and she became blind. After Gypsy lost her sight her owners no longer wanted her and an animal control officer was called in to take possession of her. The officer decided to keep her but Gypsy frequently ran into fences while in with another horse and a donkey, on several occasions acquiring wounds that caused her to need stitches. Unsure of what to do the animal control officer asked Amazing Grace Equine Sanctuary to take Gypsy in, she would otherwise be left with no choice other than to put her down. AGES had previously never had a blind horse, but did not want Gypsy to lose her life, especially over something that was not even her fault! Today Gypsy shares her paddock with Maggie, another blind mare, Frosty, and Johnnie! Gypsy will remain at AGES the rest of her days and we love her dearly. Your monthly gift as a sponsor to Gypsy will not only help provide her regular needs including feed, supplements, hay, farrier, and veterinary care, but also with the eye ointments and pain medications she requires when she has flare-ups. We thank you so much for your help, and so does Gypsy! Caesar is an older gentleman, guessing mid 20's, who we pulled from the kill lot of Ryon Simon's place in Minnesota last July. He arrived extremely thin, sore-ridden with a deep gash on a front fetlock. He also has an arthritic knee from some past injury. After many vet visits, we finally got his sliced hoof's infection under control and he began his healing journey. Almost 6 months and a good 200# later, he is doing very well and feeling pretty good! Andrew is a sorrel Appaloosa with a spotted blanket, estimated to be about 25 years old, standing about 15HH. Andrew is entertaining, joyful, playful, and always seeking attention or a treat! Andrew was rescued with Buddy in August of 2015 from a neglect situation. The pair were extremely underweight. Andrew and his brother Buddy came to us with zero handling. Andrew has learned to love, trust, and be safe and secure around adults or children. We recently learned that Andrew is blind in his left eye, which causes him to be spooky when approached from that side. This goofy boy will live out the rest of his days at AGES where he is familiar with his surroundings and adored by all. Will you sponsor Andrew?